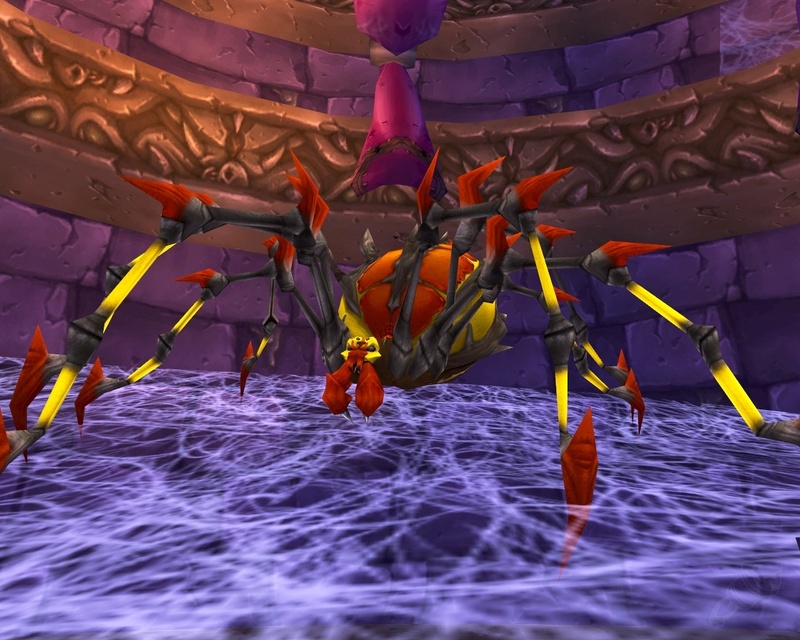 Maexxna is the end-quarter Boss fight of the Arachnid Quarter in Naxxramas. Compared to the other three end-quarter bosses, she is one of the easier to fight, and as such is usually the first end-quarter boss that new raids will kill. She is a challenge, however, and don't underestimate her abilities. Poison Shock - Does 3,500 to 4,500 (25 Player: 4,550 to 5,850) Nature damage in a 15 yard frontal cone. A basic frontal cone attack. Face Maexxna away from the raid to reduce the damage it deals to the party. Necrotic Poison - Poison effect that reduces healing taken by 90% for 30 seconds. Maexxna applies this Necrotic Poison periodically during the fight. If applied to anyone but the main tank, it's a minor annoyance. When applied to the main tank, it's a very dangerous threat. The main tank should have poison-removers up at all times. Cleansing totems and Abolish Poisons are incredibly effective here. If nothing else, all players who can cure poisons should cure the main tank immediately if this poison appears. Web Wrap - Cast 20 seconds after engaging, and every 40 seconds after that. Sends 1 (25 Player: 2) player straight to the western web wall, encasing them in a Web Wrap cocoon and incapacitating them. When encased, the player takes 2,475 to 3,025 Nature damage every 2 seconds. The cocoon can be destroyed from the outside, freeing the player and causing them to take minimal falling damage when they land. This is the first of Maexxna's three timed attacks. 10 seconds after this ability, she will summon her spiders. This ability, will wrap up a player and throw them against the wall. a ranged damage dealer should go and free them ASAP and then return to the fight. Spider Spawn - Cast 30 seconds after engaging, and every 40 seconds after that. 8-10 Maexxna Spiderlings are spawned. They have little health and damage, but may apply Necrotic Poison. They spawn underneath Maexxna. This is the second of Maexxna's three timed attacks. 10 seconds after this ability, she will stun the raid with her Web Spray. This ability, will summon many tiny spiders that will run around and attack the raid. their major threat is applying the Necrotic Poison. An Offtank should attempt to hold these so the raid doesn't have Necrotic Poison on all members. They should be ignored for the most part by everyone else, but AoE will help remove them from the fight. Web Spray - Cast every 40 seconds, incapacitating everyone for 6 seconds, and dealing 1,750 to 2,250 (25 Player: 5,225 to 5,775) Nature damage. This ability cannot be resisted. This is the final of Maexxna's three timed attacks. 20 seconds after this ability, she will wrap up a raid member with her Web Wrap. This ability, will stun the entire raid for 6 seconds and deal a moderate amount of Nature damage to them. This requires that all healers need to heal the raid up to survive the extra damage, and then put as many heal over times or shields on the main tank as possible to survive the 6 seconds of maexxna's attacks un-interrupted. Tanks should be prepared for this stun as well. Frenzy - At 30% health, Maexxna will Frenzy, increasing attack speed and damage done by 50% (25 Player: damage by 75%). Increases Maexxna's damage output past 30% health. This is dangerous, especially when coupled with Web Spray. Maexxna should not be pushed into a Frenzy before her Web Spray. the ideal time to have her enter 30% is right after Web Spray, to ensure a maximum amount of time before the next Spray in her frenzied state. Nature Resistance will reduce the amount of damage Maexxna will deal. Your first priority should be to assign a ranged damage dealer to Web Wrap duty. When a raid member is web wrapped, that damage dealer will run away from the fight to free the wrapped player. Also assign a backup member, if the first happens to get web wrapped themselves. Poison cleansers are a big requirement for this fight. As many poison removals as you can possibly afford should be up on the tank at all times to reduce the damage Necrotic Poison will do to your heals. Tank should face Maexxna away from the raid when going in, and then start counting down. you have 20 seconds before the first ability (web wrap) is used. your damage dealer will free the wrapped person. 10 seconds later, the second ability (Summon Spiders) is used. Your offtank should pick up the spiders and attempt to kill them, Healers should remove additional Necrotic Poisons if possible, and DPS can AoE if needed to kill them faster. 10 seconds later, the final ability (Web Spray) is used. Your healers should heal everyone up to survive the extra damage, but then apply as many HoTs or Shields they can to the tank. Tanks should use short cooldowns to survive if low on health, and save big cooldowns for this ability if it's used during a Frenzy. This will repeat the entire fight. When Maexxna nears 30%, slow your DPS until she uses her Web Spray. as soon as Web Spray is cleared, put her past 30% and then kill her as fast as possible, trying to avoid Web Spray during her Frenzy. If you are able to kill Maexxna, congratulations, you've just cleared the Arachnid Quarter.